The final days stingray fishing for the River Monsters Discovery Animal Planet film expedition saw the Fishsiam team once again fishing the river in its lower reaches with Jeremy Wade for Giant freshwater stingrays. Several livebaits were positioned at varying distances across the river in an attempt to capture Giant freshwater stingray. With the incoming tide filling the river to its maximum capacity conditions looked favourable for a few fish. After only twenty minutes the anglers received the first indication of stingray in the area after reeling in two baits which had been clearly crushed by Giant freshwater stingray. Rebaiting the large Owner Circle hooks with fresh livebaits Jeremy Wade quickly repositioned the rods in the main flow of the river. Thirty minutes later a distinct tapping was observed on one of the rods but the line remained motionless on the reel. The tapping continued for several more minutes before the anglers decided to retrieve the bait. After winding down the rod tip was pulled slowly towards the water indicating the presence of a stingray. Adjusting the drag accordingly the anglers tightened the line into the fish and applied pressure from above. Immediately the fish was felt to lift clear from the bottom causing the anglers to reel furiously to stay in contact with the fish. After only seconds the anglers realized that the stingray was a particularly small example of the species and the fish was quickly brought up alongside the boat. A small female Giant freshwater stingray of a mere 20-25kg’s was quickly brought into the boat where it was promptly unhooked. After delivering the stingray to the waiting scientists Jeremy Wade quickly returned to the river in the hope of catching a much larger specimen. Thirty minutes later another rod was away again! This time stripping line from the reel at an alarming rate! After winding down into the unseen predator the rod was looped over towards the river as the stingray responded with another display of power. A short protracted battle of fifteen minutes followed seeing the anglers lifting the fish from the bottom on several occasions only for it to dive back down to riverbed. Constant pressure applied from above soon tamed the stingray’s powerful runs and saw the fish being played out in open water with relative ease by the expert angler. 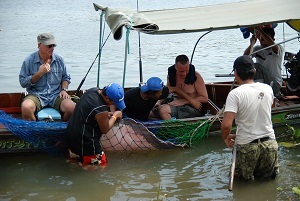 After netting the fish the Giant freshwater stingray was transported back to the waiting scientists. The Giant freshwater stingray was observed to be another male and weighed at a weight of 50kg’s and was found to be in perfect condition. An electronic tag was soon fitted and tissue samples were collected by fish biologist Jeremy Wade before the fish was released back into the Maeklong River. This would be the final stingray caught during the River Monsters show filmed with Dr. Jeremy Wade for Discovery Animal Planet. River Monsters Season 2 has already aired on Animal Planet and will be showing on ITV in the UK shortly. It is incredible that there are so many Stingrays in this river. Jeremy is always tested to focus more clearly so as to not be harmed in these expeditions. Even several years later, this content is still relative and exciting.